Prof. Dr. Abdel Nasser Sengab Vice-President of Ain Shams University for Postgraduate Studies and Research and Prof. Dr. Nazmi Abdul Hamid, Vice President for Community Service and Environmental Development, received Prof. Dr. "Shi Yao Chi" President of the Guangdong University of China. They also received Dean of the Chinese Language School and Director of the Office of International Cooperation of Guangdong University, in the presence of Prof. Dr. Esraa Abdel-Sayed, Director of the International Cooperation Office at Ain Shams University and Director of Confucius Ain Shams. During the meeting which is held at Al-Zaffran Palace, the two sides discussed means of cooperation between the two universities in the field of exchange of students and professors as well as the activation of joint scientific certificates. Prof. Dr. Nazmi Abdul Hamid stressed that the success of Ain Shams University in activating numerous international partnerships among many universities around the world. He pointed out that Ain Shams University is one of the largest public universities in which more than 210,000 students are studying and more than 16,000 faculty members. The establishment of scientific and research partnerships with different universities of the world is important to both parties. He hoped to host the next session of the International Federation of China in coordination with the Ain Shams Confucius. Prof. Dr. Abdul-Nasser Sengab discussed ways to establish joint scientific certificates between the two universities. He explained that Ain Shams University attaches great importance to the separation of Confucius and provides it with all the care and support to achieve his desired goals in the service of those who want to study of Chinese language and culture, in particular, it serves a broad sector of the public in Cairo unchallenged. 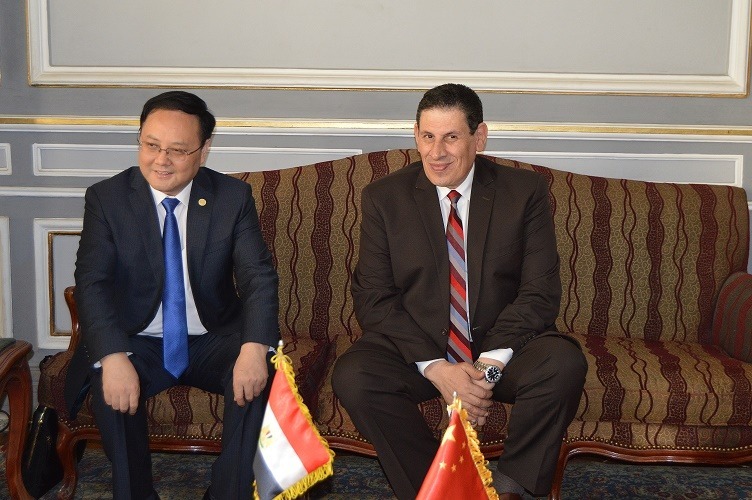 Dr. "Shi Yao Chi" expressed his happiness to visit Cairo and Ain Shams University for the first time, praising the warm reception and welcome. He expressed his interest in opening avenues of cooperation with Ain Shams University and expanding the partnership base, especially in relation to Ain Shams University, which confirmed that the National Bureau of Chinese Language and the Chinese Embassy in Cairo are keen to support the success of the Ain Shams Confucius. Prof. Dr. Esraa Al-Sayed pointed out that the Confucius of Ain Shams has been witnessing a turnout from various age groups since the opening of the entrance since October 11, adding that the registration and filling of the forms is continuing for one month until 11 November. After the meeting, the two sides exchanged gifts and commemorative photographs. The delegation then visited the Ain Shams Confucius headquarters as well as a visit to the land designated for its building.